WCRC is a Non-profit Organization that strives to protect, conserve and restore natural resources by utilizing the watershed approach, environmental outreach and providing planning and technical assistance to landowners, communities and government. 13 years ago, 13 projects 19,000 feet, Sandi J. Formica and Mathew Van Eps, P.E. formed the Watershed Conservation Resource Center (WCRC), a 501(c)(3) nonprofit organization; committed to making a difference through conservation and restoration. WCRC recognizes that safe‐ guarding our Nation’s natural resources and protecting water quality requires the will of well‐ organized individuals, strategic funding mechanisms, and broad community support. The foundation of any natural resource protection effort also requires technical and scientific information in order to effectively communicate the causes and consequences of environmental problems. 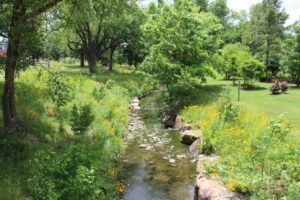 WCRC has secured over 4.1 million dollars in federal grants and has leveraged a similar amount of local funding and in-kind services, to conduct watershed-based initiatives in Arkansas. The WCRC is recognized for its expertise in designing and implementing stream restoration plans using a natural channel design approach. Working with multiple landowners and partners, the WCRC has successfully implemented 14 stream restoration projects that includes over 6,000 feet of restoration and stabilization including projects on small urban stream and large rivers in rural settings. For all of these projects, the WCRC provided project management and collected the field data, conducted the stream stability assessment, developed the restoration design along with construction drawings and specifications, obtained and coordinated construction materials, obtained required permitting and flood plain management approval, provided construction oversight, and developed and implemented site re‐vegetation plans. The WCRC continues to monitor, evaluate, and maintain all of these sites. Implementation of these projects has resulted in the reduction of sediment and phosphorus loadings in the Beaver Lake and Illinois River watersheds. 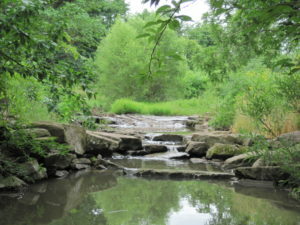 The stream restoration projects have protected city parks, utility infrastructure, a historic cemetery, and private property during high flow events including the 2011, 2015, and 2017 flooding in Washington County. Through the success of these projects, the WCRC has been able to secure additional funding to restore additional streams, improving water quality and aquatic habitats throughout Arkansas.